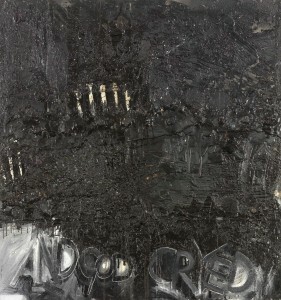 John Blackburn, ‘And God Cryed’, 2011/12, mixed media on board. John Blackburn, ‘Nine Little Balls’, 2012, mixed media on canvas laid on board. PLEASE NOTE THAT THE GALLERY WILL CLOSE ON WEDNESDAY 5 DECEMBER BETWEEN 3pm AND 5PM. This is because it will be in use for a UCAS visit day. There may be some disruption in the gallery before and after these times. Visitors are welcome to view the paintings around the Jarman Building during this time. One of the most ‘vital and exhilarating’ English painters of modern times, John Blackburn, has a new exhibition opening at the University of Kent on 24 September 2012. Entitled And God Cryed, the exhibition will run at the University’s Studio 3 Gallery until 14 December 2012. Admission is free and it’s open Monday – Friday, 9am – 5pm. 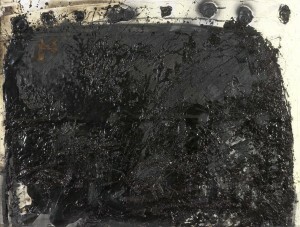 Studio 3 gallery curator Ben Thomas said: ‘The title of the Studio 3 exhibition And God Cryed refers to the Holocaust, and is also one of a series of very personal texts deployed in a group of ‘black’ paintings executed in a variety of materials including pitch (and exhibited here for the first time). ‘In a way these works see Blackburn returning to the concerns of his earliest authentic artistic statements, the Encaustic Paintings made in New Zealand in the late 1950s. Martin Hopkinson writes in the catalogue essay of Blackburn’s recent paintings: ‘The blackness, the words of the inscriptions, and their partial obliteration all express Blackburn’s deep concerns with the human condition and human behavior, but they should not be read as indicating a bleak outlook on life, as anybody meeting and conversing with this ebullient man, still burning with energy, soon realizes. He has engaged in a lifelong struggle in ‘a dangerous place’, facing significant decisions for his art every few minutes, as he strives to stay on the right side of the very fine line between success and failure’. 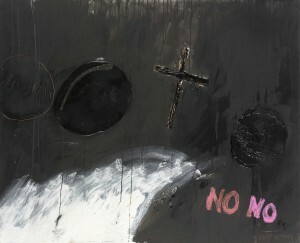 John Blackburn, ‘No No’, 2012, mixed media on board. John Blackburn, ‘Black Shoe Triptych’, 2011/12, mixed media on board. Previous Previous post: Blackburn installation complete!